The ancient martyrology of the Church of Rome marks February 14th as the remembrance of "the martyr Valentine, presbyter of Rome" (Valentinus means "vigorous" in Latin). Unfortunately the historical data for the Saint is incomplete. "Why, Valentine, do you want to be a friend of our enemies and reject our friendship?" asked the Emperor. The Saint replied: "My lord, if you knew the gift of God, you would be happy together with your empire and would reject the worship of idols and worship the true God and His Son Jesus Christ." One of the judges stopped the Saint and asked him what he thought about Jupiter and Mercury, and Valentine boldly replied: "They are miserable, and spent their lives in corruption and crime!" The judge furiously shouted: "He blasphemes against the gods and against the empire!" The Emperor, however, continued his questions with curiosity, and found a welcome opportunity to finally learn what was the faith of Christians. Valentine then found the courage to urge him to repent for the blood of the Christians that was shed. "Believe in Jesus Christ, be baptized and you will be saved, and from this time forward the glory of your empire will be ensured as well as the triumph of your armory." Claudius became convinced, and said to those who were present: "What a beautiful teaching this man preaches." But the Mayor of Rome, dissatisfied, began to shout: "See how this Christian misled our Prince." Then Claudius brought the Saint to another judge. He was called Asterios, and he had a little girl who was blind for two years. Listening about Jesus Christ, that He is the Light of the World, he asked Valentine if he could give that light to his child. St. Valentine put his hand on her eyes and prayed: "Lord Jesus Christ, true Light, illuminate this blind child." Oh the great miracle! The child could see! So the judge with all his family confessed Christ. Having fasted for three days, he destroyed the idols that were in the house and finally received Holy Baptism. After the martyrdom some Christians salvaged the body of the Saint and put a bit of his blood in a vile. 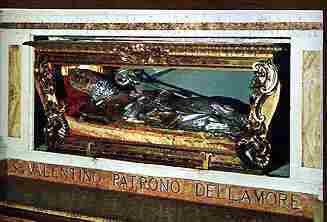 The body of the Martyr was moved and buried in the Catacombs of St. Priscilla, a burial place of most of the martyrs. Over the years somehow he was "forgotten", since almost every day there were buried in these catacombs new martyrs for several decades. The memory of Valentine's martyrdom however remained robust, particularly in the local Church of Rome. Officially the memory of St. Valentine was established in 496 by Pope St. Gelasius. Fifteen centuries pass and we arrive at 1815, at which time divine intention was to "disturb" the eternal repose of the Saint. 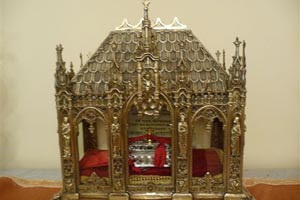 Then the relics were donated by the Pope to a gentle Italian priest (according to the custom of the time). After this the relics are "lost" again until 1907 where we find them in Mytilene in the Roman Catholic Church of Our Lady. It seems that after the death of the priest that a descendant of his had inherited the relics and had migrated to Mytilene, which was then a thriving community of West-European Catholic Christians. There they remained until 1990 when they were moved to Athens in the Church of Saints Francis and Clara's Italian community, where they are today. We should first say that there is not sufficient information on the national origin of the Saint, though there are some other (shades of) evidence that the Saint was of Greek origin. For example, the earliest depiction of the Saint bearing the inscription «O ΑΓΙΟC BAΛΕΝΤΙΝΟC" in Greek is in the Church of Our Lady the Ancient (Santa Maria Antiqua) of the 6th century which was the parish of Greeks in Rome. The church particularly venerated saints who were Greeks and generally from the East. The decoration and renovation of the church was ordered by the Greek Pope John VII (705-707) and finished by his successors, including the last Greek Pope Zacharias (741-752). But perhaps it is no coincidence that after seventeen centuries, the remains arrived in Greece. The issue here still requires research. Apart from the scant historical data we have for Valentine's life, there is accompanied various legends, such as from those who say he is the patron saint of lovers. 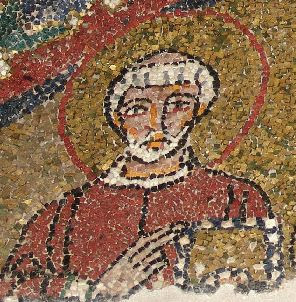 Besides all this, the likely choice of him as the "saint of lovers" is to be associated with the pagan festival of Lupercalia, a fertility festival, celebrated by the Romans on February 15. Others connect the celebration of this feast with the mating season of birds during this period. Certainly, however, the Saint has nothing to do with the commercialism (marketing) of flowers, gifts and secular centers which trivialize Eros, this great gift of God. 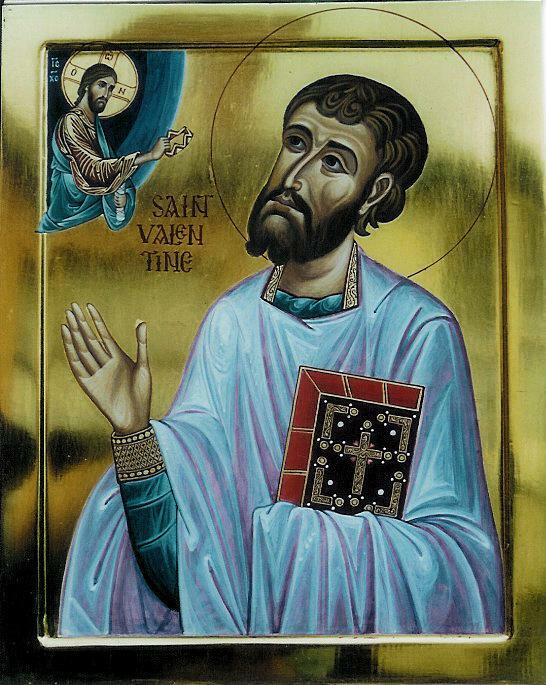 Many, however, raise the objection that St. Valentine is not mentioned anywhere in the calendar of the Orthodox Church. Indeed on 14 February in the calendar of the Church there are commemorated Saints Auxentios, Maron and the martyrs Nicholas and Damian. The explanation is simple: in ancient times hagiographic directories, biographies and martyrologies were written to be primarily used locally in their own character, and the fame and reputation of a saint locally does not mean that it extended also throughout the Church. 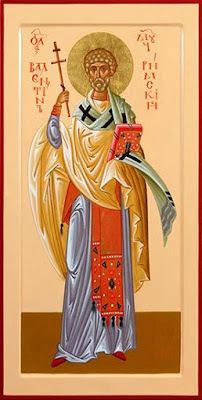 So there may be saints honored widely in one region and completely unknown in another, as for example St. Demetrios, who is famous throughout the Eastern Church, yet in the West is not honored at all, and is almost unknown, but this does not mean that he is not a saint. Another example of the modern Church: St. Chrysostomos of Smyrna († 1922) who in Greece is known, yet in Russia is completely unknown, but this does not mean that he is not a saint. We honor our saints and St. Valentine when we imitate their courage to proclaim their faith in Christ the Savior, which they did even at the cost of their lives. We honor them when we beseech them to appeal to God to have mercy on us and forgive our many sins. We honor them when they are our models of the life in Christ. We do not honor the saints when we measure their 'worth' by worldly amusements and festivities even in the best circumstances ... To honor the Martyrs is to imitate the Martyrs!